Happy Friday! Hoping you all are looking forward to a relaxing weekend!! No snow predicted for us, so that alone makes the upcoming weekend awesome!! As most of you know, because you graciously voted for me, I won a Holiday Recipe Contest with my Mini Caramel Cheesecakes. It was hosted by Jen and Maria over at Amateur Kitchen. Jen and her daughter Maria host a ton of great video cooking webisodes. You can find them here. Their recipes are easy, and they show step by step direction, and they are DELICIOUS! Jen is a mom who encourages kids helping in the kitchen and it is obvious by Maria's excitement on each video she has done a great job getting her to help, try new things and understand cooking. I just love their YouTube channel and never miss a new upload! When I won this contest, I was awarded a beautiful cookbook, pie plate, spatula's, and adorable pie crust design cutters! (great pick Maria, you rock) As a "thank you" I wanted to prepare a dish from the cookbook in this pie plate/casserole that I LOVE. Seriously, I LOVE it. So I adapted a recipe out of the cookbook. I had been wanting to make my husband something blueberry and I couldn't decide on a crisp or a pie and this is the collision of both of those worlds! 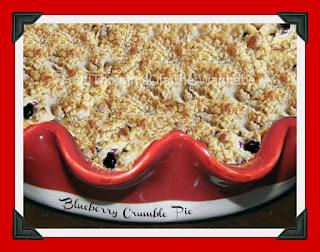 You get blueberry crisp and blueberry pie in one. This recipe is adapted from the Williams-Sonoma, Essentials of Baking Cookbook. Though you can't see it, the pie plate they sent me was the exact one on the front of the cookbook. So cool. I served this straight out of the oven almost, alongside a scoop of vanilla ice scream. You still get the crust of the pie, the crumble of the top and the hot sweet blueberries melting your ice cream a little. Complete joy!!! 1 pie crust. I used a premade pie crust but my pie crust recipe is the best you will ever eat. You can find it here with my recipe for Caramel Apple Crostata Basic Pie Crust. This will make 2 crusts, you only need one so either half the recipe or....save it! You will need to place your shell in your pie plate and partially bake it. Place the dough into your pie plate, then, cover the bottom with parchment or foil and fill with dry beans or pie weights or rice. Bake for 15 minutes. Remove from the oven and let cool. Turn oven down to 375 degrees at this time. Mix all ingredients in a large bowl. Set aside and make crumble topping. In a bowl mix flour, sugar and vanilla. Add in cold cubed butter and with your fingers or a pastry cutter, combine until your mixture is pea size. The chunkier you leave the crumble the the chunkier it will be on your pie. Pour blueberry mixture into your partially baked pie shell. Distribute the crumble on top evenly. I admittedly, made a batch and a half of the crumble because I wanted ALOT of crumble. It was the perfect amount. Bake for 50-60 minutes. The recipe says to let it cook before serving. You decide, I served it hot over ice cream!! YUMMO! 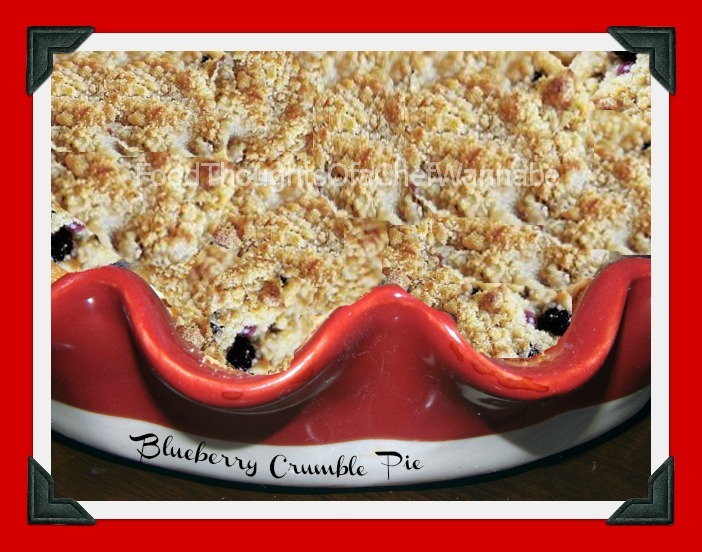 Enjoy this delicious blueberry delight! Thanks to Jen and Maria for this gorgeous pie plate you KNOW I love!